Focus regions of MiKlip Module-C and participating projects. The prediction of climate over time scales longer than a few days (e.g. weather forecast) or recently developing seasonal forecasts exhibit a new area of earth system research. A potential predictability of the climate on decadal time scales emerges from slow variations in the coupled ocean/atmosphere system. Among such variations multi-decadal variations of the ocean currents - like the Atlantic Meridional Overturning Circulation (AMOC), which as a period of about 65 - 70 years. Aim of MiKlip – next to investigate basic research questions regarding this long-term climate variability – is to establish a pre-operational forecast system for time periods up to 10 years ahead. Such forecasts exhibit a new type of climate information, which is relevant as well for political as for economic decisions. MiKlip is divided into 5 modules working on different aspects of the research problem: A –initialisation/data-assimilation, B – processes, C – regionalisation, D – integration and synthesis, E – evaluation. IMK-TRO coordinates the module C “regionalisation” of MiKlip (project REGIO_PREDICT). This module is dedicated to the downscaling of the global forecasts to provide regional decadal ensemble predictions on scales which are needed by potential stake- holders as well as to study the feedbacks of regional scale processes on the global scale predictability. It coordinates the joint research project DecReg which will develop ensemble forecasts for Europe using COSMO-CLM – especially with respect to soil interactions and the nesting strategy. DecReg contributes among other projects to a regional ensemble prediction system for Europe. 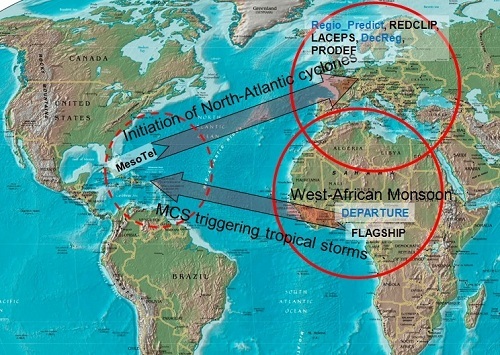 It participates in the joint project DEPARTURE which studies the decadal predictabil-ity of the West African monsoon and the generation of tropical cyclones over north-western Africa and the Atlantic. The working group provides regional fore-casts with COSMO-CLM with a special focus on the description of land-atmosphere interaction. The simulations are part of a multi-RCM ensemble for Africa. contributes among other projects to a regional ensemble prediction system for Europe.